Prime Minister Narendra Modi on Sunday said those opposing the bullet train project should travel on bullock carts. AHMEDABAD: The stage was Gujarat, but the backdrop was the Congress’s internal polls for Rahul Gandhi’s elevation to the party president’s post. Resuming his campaign for the first phase of the Assembly elections on his home turf, Prime Minister Narendra Modi, addressing rallies in Bharuch, Surendranagar and Rajkot, took pot-shots at the Congress for ‘intolerance’, lack of inner party democracy, opposing him for the sake of opposing — like on the bullet train project — and for ‘divisive’ politics. The Prime Minister, pooh-poohing those who criticised him for clinching the high-value bullet train project with Japanese aid instead of focusing on improving basic rail infrastructure, said, “Those opposing the bullet train project should travel on bullock carts. We won’t mind.” Hitting back at Gandhinagar archbishop Thomas Macwan, who warned people against ‘nationalist forces’, the PM said his government had got back Father Tom and Father Prem from terrorists in Yemen and Afghanistan. 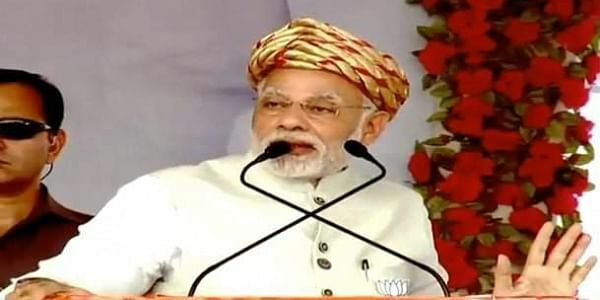 In Bharuch and Kutch, where Muslims are in big numbers, Modi recalled that during the Congress rule, the area would be mostly under curfew because of violence.